1917 Ladies Home Journal Resinol Soap Magazine Advertisement. Don't try to cover up a poor complexion, clear it up with Resinol Soap. Resinol Chem Co., Baltimore, Maryland. Ad is 16" high and 10 1/2" wide. Advertisement is in good condition, wear and small tears at edges, suitable for framing. 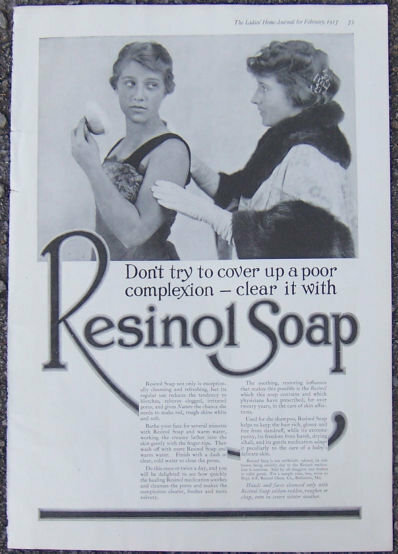 Items Similar To "Resinol Soap for Complexion 1917 Magazine Advertisement"